Original patch by Chris Covell with lots of help from Mina Takahashi, the updated patch described below has been prepatched onto the original. Original patches are included. 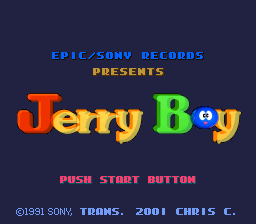 Jerry Boy is a platformer created by Game Freak (of Pokemon fame). 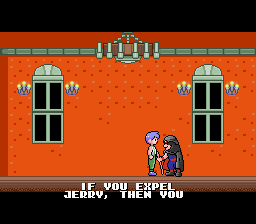 It was released for the Super Famicom in September 1991. It was released in North America as Smart Ball in April 1992. However, the North American version removed the story cutscenes. 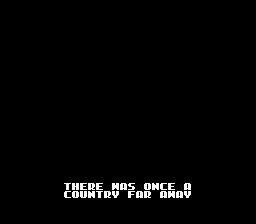 So, I took some time to replace the mixed-case font with the game's original 8x8 English all-caps font to make it look more consistent. 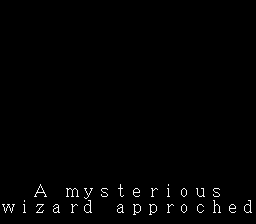 I also had to fix up some of the game's code to make it display properly. Additionally, I have included (possibly the) one improvement made in the American version: You can shoot with L or R, which stops you from having to waste a shot of your semi-limited ammo every time you press X or Y to move faster or stick to a wall. Next, I started translating the text (with many references to a Japanese dictionary), and I enlisted the help of my friend, Mina Takahashi. I got ahold of a suitable 16x16 Roman font, colourized it and gave it an outline, and bunged it into the CHR space. After that, it was just the laborious task of putting in the text and re-wording it to make it fit in the constrained space of the screen. Last, I tried to find some place to add my name briefly. (The game is programmed tightly, so it was a little difficult.) 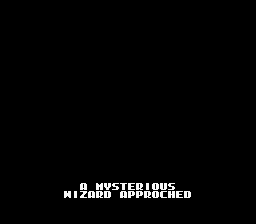 I eventually decided to put it on the title screen, and so I had to figure out how THAT text was stored. 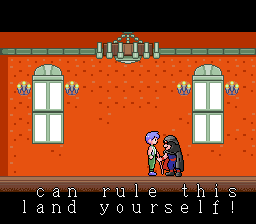 The text is a bunch of sprites, so I had to experiment with a few things until I gave up and simply changed the CHR graphics again. I've given the game a couple of runs through, so it should be error-free. I even fixed up a couple of graphics bugs that were in the original game. There is a bit of text (which I've also translated) that I never encounter playing the game. There seems to be an alternate ending; does anybody know how to access it? Or, was it taken out of the production version? 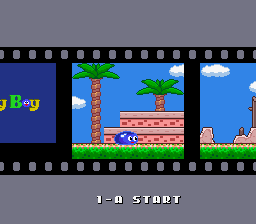 Here are some SNES Game Genie (and Action Replay) codes which I've made for Jerry Boy. Thanks: To Epic/Sony/Game Freak/System Sacom for a cute and fun game! Mina Takahashi, for all your help. Ai shiteru! Anti-Thanks: To Sony Imagesoft for cheaping out on us Westerners. Nintendo, for your censorship which rears its ugly head again.